Pork cocktail sausages wrapped in smoked streaky bacon. 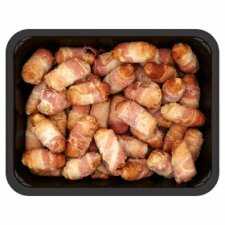 36 Pigs in Blankets, made using succulent sausages, which are hand rolled in a delicious smoked streaky bacon. For best results serve hot. Pork Sausage (75%), Cooked Smoked Bacon (25%). Pork Sausage contains: Pork, Rusk (contains Wheat Flour), Water, Pork Fat, Wheat Flour, Salt, Dextrose, Sugar, Stabiliser (Disodium Diphosphate), Black Pepper, Yeast Extract, Mace, Spice Extracts (Pepper, Nutmeg, Mace, Cayenne Extract, Ginger), Nutmeg, Sage Extract, Filled into U.K, and non U.K, beef collagen casings. Cooked Smoked Bacon contains: Pork, Salt, Preservatives (Sodium Nitrite, Potassium Nitrate), Antioxidant (Sodium Ascorbate). Contains gluten and wheat. May contain Nuts.For allergens, including cereals containing gluten, see ingredients in bold. Keep refrigerated., Once opened, consume within 2 days and by 'use by' date shown., This product may have been previously frozen and has been restored to chill temperatures under carefully controlled conditions. Not suitable for home freezing. Instructions: For best results oven heat. Remove all packaging. Place the pigs in blankets on a baking tray in the centre of a pre-heated oven.